First Day of Farm Stand April 21 TOMORROW! Posted 4/20/2015 3:10pm by Gregg Keckler. Posted 4/8/2015 5:24pm by Gregg Keckler. Spring has Sprung! We are overwhelmed with work. One month ago we were trying to find things to do to keep busy outside. Now we are so busy that we cannot keep up. Gregg, Oliver, Juan and Julie planted all the sweet onions. We are hoping to get the leeks planted tomorrow. Saturday at the work day we are hoping to get a lot of garlic transplanted, blackberry bushes planted and possibly strawberries planted. Gregg is finishing up with the jam and applesauce for the year. He is still trying to squeeze in time to make a couple more batches of Shag Bark Hickory syrup. We settled on part of the land that we were planning to purchase in March! Now Oliver will be signing the papers for the second part which is the house and outbuildings this Friday. The elderly folks who live there will not have to leave until September, 2016, but we will have access to the land and outbuildings. Thanks to everyone who helped by loaning us money for this capital project. You have saved us interest money and what is best we have built a trusting relationship with you. Thanks again. We will let folks know when we have other opportunities to invest in capital projects. For everyone who is coming on Saturday if you can - PLEASE BRING EGG CARTONS! We are desperate! For folks who are not coming on Saturday, please bring your cartons to the first market that you will be attending this year or save them for the first drop off of the CSA. These cartons mean a lot to us. We do not recycle them, we reuse them. This saves energy, time, pollution, etc. Please join us in this effort to reuse not recycle! We got our first batch of 100 broilers today! They are enjoying their new home in the barn under the heat lamps. Gregg has been working in the high tunnel this spring. He have quite a bit to show for his efforts including lettuce, kale, spring onions and tomatoes - well not exactly tomatoes yet but the plants have been planted! Our greenhouse is going in full force. Juan and Gregg were transplanting the small seedlings into larger flats today. These flats will be then going out into the fields in a couple of weeks. They were transplanting tomatoes, cabbage, broccoli and flowers today. If you have not signed up yet for the CSA and are planning to - please do it now! This year the numbers seem to be a bit low for the CSA. Gregg is usually the negative one who claims that folks aren't going to be coming in at all. Oliver is usually the optimistic one who claims that everyone is waiting for April and May to sign up. I am not sure what to think. We could have just had a very good couple of years and now things are settling back to the 2012 numbers. In any case - it will help us greatly to make plans if we know how many folks to expect this year. GREAT NEWS! We have a new Farm Stand for Saturdays. We will still be at Westminster on Saturdays and also St. Luke's in Alexandria on Saturdays. We are also adding a new farm stand at St Mark's Episcopal Church on 6744 S. King's Highway, Alexandria on Saturdays. This new farm stand will be opening on MAY 2. The hours will be from 8 am until 1 pm. If you live in this neighborhood please spread the word and come out to see us on May 2. The CSA will be starting on June 1 this year for the spring session. We are looking forward to asparagus, lettuce, spinach, red beets spring onions, apples, radishes, peas and other great spring crops. We hope you will join us. DEADLINE TO SIGN UP FOR THE CSA IS MAY 15!!! Posted 4/6/2015 2:51pm by Gregg Keckler. We have our annual work day scheduled for Saturday, April 11 at 11;00am RAIN or SHINE! If you have not already contacted us, please let us know if you are planning to come. We have blackberry bushes to plant; garlic to transplant, and strawberry plants to plant. \We will have a lunch served around 2:00pm. We will give folks a tour of everything! We would love to have you come. So if you are not busy that day - come for a great day! Posted 3/23/2015 2:43pm by Gregg Keckler. This is a reminder about our Annual Spring Work Day. We will also being giving a tour as well. We will begin the work day at 11:00am. I think that folks will be planting blackberries bushes, onion sets, and possibly strawberry plants. We will have a tour of all the fields and the animals and especially the new fields that we just purchased with the capital projects money. We will end the day with a lunch and then folks can take a leisurely trip back to MD or DC. please let us know if you are planning to come. So far there are 12 people coming. We can use a lot more help if you are free and would like to get out in the fresh air and the sunshine (hopefully). Gregg is finishing up his jam making with one last batch of shagbark hickory syrup. Oliver and Juan have been working in the high tunnel. The greenhouse is just about full of young plants and seedlings. Today everyone helped to transplant kale into the high tunnel. I should be getting the first batch of broilers next week. We are hoping that the CSA sign ups will pick up here in the next couple of weeks. It is down from last year. We were thinking it was the weather, but Gregg is sure that it is the economy. We are not sure which one - or maybe folks are just procrastinating this year. In any case, if you have not signup up yet for the CSA and you are planning to - please do it soon. These early numbers will help us to plan how much to plant for early crops for the spring session. We are looking forward to the first market - National Geographic in the courtyard will be starting on April 21! The great news is that Sarah - our third oldest daughter got married on Saturday! She owns the Twirley Top Ice Cream and Burger stop near us at the lakes. We had a busy weekend and now that that is behind us we are looking forward to the spring and the market season. Let us know if you would like any flyers to encourage folks to sign up for the CSA at your business or neighborhood. Posted 3/2/2015 4:01pm by Gregg Keckler. We hope you are enjoying the winter time. It looks like we are still in the middle of winter here in south central Pennsylvania. We have about 5 inches of snow on the ground and temperatures in the 30's. But today was very sunny and a lot of melting going on. With the melting of course we get the mud! Juan and Oliver have been cleaning up our new property. The elderly couple will still be living in the house until September, 2016, but we are using all the barns, sheds and the land. Oliver and Juan are cutting branches from trees, trying to pull willows from the pond banks, and cleaning out some of the sheds. We have a load of chicken manure coming this week for the fields. We are also going to be planting strawberries there this spring. Thanks to all who helped us with this purchase. You have saved us a lot of interest money and have given us new vigor to produce good vegetables and fruits for you! If you would like to help with any other capital projects in the future, send us an email and we can send you information about how you can help. We will be having another capital project coming due in August of 2015. Gregg is still making jam and applesauce. He is getting ready to plant kale and red beets in the high tunnel for early vegetables for the first markets. Gregg has been planting seeds in the greenhouse to get things started. This month the greenhouse should be going in full force. Gregg has his calendar out calculating when things need to be planted in order to have them ready to be transplanted to the fields so that they will be ready to pick in time for the CSA. This is very fun and exciting to plan. Some things he plans well and other things do not always work. trial and error are some of the best teachers! Thanks to all who have signed up for the CSA in February, we are just 5 short of last years totals for this time last year. We are hoping for a large sign up in March. Please do not put it off. Sign up today. For folks at businesses, try to encourage people to sign up early. If you have a business or neighborhood that would like to get a drop off for the 2015 season, please let us know and we can send you a flyer to send around. You need to have 6 shares ( any size) for a drop off to your location. We are going to be having only one work day this spring, Saturday, April 11, 2015. Please let us know if you intend to come for this day. We will provide a lunch and a tour and a wonderful day in the sunshine (or rain) smelling the earth and feeling the gentle breezes! We are hoping to plant blackberries that day and also onions and peas. We will be getting our first batch of broilers on the first of April. We will also be getting another 50 layers in April. We now have 5 nice sized hogs. They weigh about 120 lbs. They are having a great time digging holes in their bedding, playing in the hay and eating, of course. We have four feeder steers right now. We should be getting about 3 more before May. If you know of any location, not a market, but a location where we could set up for a farm stand for the 2015 market season. please let us know. We are searching diligently for a good spot, with visibility and parking for a new farm stand location. We would like to have it in northern Virginia or DC or Bethesda-Rockville area. Please let us know if you know of a church parking lot or a business location that would be available for use on a Saturday morning. If you are new to the CSA - we will be sending our monthly emails until the last week of May. Then we will send out an email telling everyone how the drop offs and deliveries will be handled. We will also be sending out emails weekly throughout the CSA season letting everyone know what to expect in the boxes for the week and also information about purchasing extras. We have watched a DVD called Symphony of the Soil this winter - Thanks Ilga! This has really gotten Gregg started on compost tea. I have always enjoyed composting, but mostly on a small scale. Gregg is planning to take this to a larger scale this year for use on some of the fields. We have been in contact with Nic, our soil specialist who is giving Gregg and Oliver advice on ways to help, not just the soil chemistry, but also the microbe health within the soil. We are looking forward to the spring time! It is hard to believe that NGS Farm Stand will be starting the 21st of April; St. Luke's will start on May 2; DOT market will be starting May 5; East Columbia Library on May 7; and Westminster Farmer's Market will be opening on May 16th. ALSO NEW drop off location. We will have a drop off location in Silver Spring at a private home located at: Silver Spring. If this would be a convenient spot for you to pick up, just choose this location from the choices on the CSA sign up. This is a Friday delivery to this location. This might be a good option if you would be on your way home or even before you leave in the morning to get to work. Let me know if you have any questions about this drop off. By the way, we still have a lot of eggs and apples. If anyone would like to may a trek to Pennsylvania to stock up on eggs and apples, please let us know. We had several groups come up this month to visit and pick up some things. It was great seeing everyone and selling some eggs too :) Let us know if you have a questions or concerns that we could help you with. Posted 2/12/2015 2:59pm by Gregg Keckler. We hope that you are enjoying the winter months. We are working hard - just doing things differently than the hectic summer time schedule. Gregg is working on a composting recipe and making composting tea for the high tunnel. The high tunnel is looking very well. Gregg is excited to get things started in there. He planted a couple flats of kale seeds to transplant into the high tunnel in March. Oliver cleaned out the manure in the chicken shed and spread it in the high tunnel as well. So that soil is looking great. Gregg is also busy with jam-making. He has made several batches of Shagbark Hickory syrup and also lots of applesauce. Nic, our soil specialist, has given Oliver his advice for several of the fields that we are trying to repair. We will be spreading molasses on the one. The field has improved so much in calcium and nitrogen since last year. Now we are trying to get the good microbes working. The molasses should do it! Doesn't sugar get you motivatied? Oliver and Juan have been doing some work on the new farm that we are purchasing. We will be settling for it at the end of February. Thanks to all who were able to help us with loans for the principle amount. These have helped us to avoid costly interest payments, so we can put our money into our fields and vegetables. This farm had been neglected for some time, so Oliver and Juan were pulling out trees and shrubs that were growing in the wrong places. Unfortunately there are alot of willow trees growing on the bank of the pond. Although they may look pretty they can ruin a pond. We are probably going to need some more expert advice on removing them and when to do it. The outbuildings need repairs and/or torn down completely. If you saw it you might think it is too large of a job, but we can truly see the potential and Oliver and Juan are young and LOVE the physical work! Also the price was right. The elderly folks who own the property will still be able to live there until September, 2016. During that time they will be removing all the junk and stuff that has been accumulated over the years. Oliver will be helping them with this huge job. We will be having two work days this spring. If you are available, please come! We would love to have you visit and also help us to do some planting. The first work day will probably be Friday, March 27. At this work day we will be planting spring onions. The second work day will be on Saturday, April 11. We will be planting blackberry bushes at that one. I will be sending you more specific emails about these days as we get closer. Make a day of it, come visit the farm, do some work and get a good meal as well! If you have not signed up yet for the 2015 CSA season - now is the time! You can go to the website www.orchardcountryproduce.com and sign up. You will automatically get the early bird discount when you sign up for all three session. You can also save an additional 4% if you send a check for the total. If you would like to organize a drop off for the CSA please let us know and we can send you information and flyers to distribute at your workplace or neighborhood. If you live in an apartment complex and community we would love to organize a drop off at your home. Please give us the contact information for your building management and we will contact them and see if we cannot get a drop off there. We are also looking for a new Farm Stand location for a Saturday. Does any one have any ideas of a great location for a Saturday Farm Stand? If so, please let us know and we will try to coordinate with the property owners. Thanks to all who have supported us over the years. Your loyalty and faithfulness have inspired us to keep on producing and planting and trying to improve our techniques and develop new marketing strategies. We are looking forward to seeing everyone in the Spring. Again if you are in the area or if you would like to take a short 1 and 1/2 hour drive to the farm, we would love to have you come. 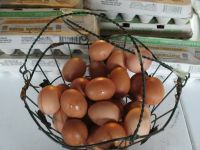 We have LOTS of fresh eggs and apples! Let us know and we would look forward to seeing you. Posted 1/26/2015 4:08pm by Gregg Keckler. Posted 1/26/2015 3:20pm by Gregg Keckler. We hope that you are having a great winter! Beth Hall hall.beth@gmail.com from River Park is planning to make a run up here to pick up some produce, eggs and meat this Saturday, January 31. She has offered to pick up items for folks who live there at River Park. I am sending this email to let you know about the delivery and also to let you know what we have to sell right now. Beth will be coming up here on Saturday. If you would like to purchase any items, just send me an email and also copy Beth to it as well. Then either give her the cash or a check for your purchases as well as bags to put everything in. She will be coming here on Saturday and returning to River Park on Sunday. She will put all the items in the usual CSA pick up location at River Park and you can pick up then. Choose which variety or you can choose a mix. Posted 1/17/2015 12:13pm by Gregg Keckler. We hope that you are enjoying your winter months. We are doing some much-needed repair projects and new construction. Gregg, Oliver and Juan have put a new high tunnel that will be very fun to work in this spring. We are hoping to have some early greens and veggies for the very first markets of the year. Gregg is already envisioning how everything will work and look in this high tunnel. We know that you will benefit from the early greens and we will not feel so guilty at the first markets when we have nothing to sell but asparagus. Speaking of asparagus, the field that we plants with 10,000 asparagus roots last year is looking very good. Nick, our soil specialist who helps us to get our soil in optimum condition took some samples and he was pleasantly surprise at how much better the field is doing. Last year we added tons (literally) of calcium and chicken manure. Now we are working to improve the bio-mass of bacteria (the good ones) to improve the aeration of the soil. Our main and most important tractor, the Kubota, went in for serious heart surgery at Christmas and we are hoping to have it back by the end of January. We did get all the plastic out of the fields before the tractor went to the shop. Juan is pruning trees; Oliver is doing general clean up and repair; Gregg is making jam and canning applesauce. This week Oliver and Juan will be butchering some two year old layers. So we will be starting out the market season with stewing chickens. We are overwhelmed with eggs right now. We are trying to sell them at the house, but everyone around here has chickens of their own. We are taking them to auction every Tuesday just to get rid of them. If you would like to make the drive up here to stock up on eggs, let us know - We will give you a good discount for the drive. Eggs do keep very well, the ones you buy in the stores are usually between two and four months old. We struck the first deal in our two part deal about purchasing another farm. We negotiated and purchased a nine acre farm with a house and many outbuilding and a large pond. We are still working on the deal for the 17 acres of adjacent land. The land is not being sold by the same person as the farm. We have not yet reached an agreement, but we are only about $12,000 away. So hopefully before the end of February we have that finalized. Thanks to all who have helped us with these purchases by loaning us money. We really do appreciate you support. If others could and would like to help us, let us know and we will explain how you can help. We are planning Spring Work days and Visit the Farm days. We will let you know more particularly about the details in February, but we would like to hold a work day in late March and another in April. We will see how the weather seems and how soon we can get into the ground. I know that Gregg and Oliver have been talking about a lot of blackberry bushes and strawberry plants for sure. I know that there are gooseberries to be transplanted and many other things. We have also got some new pigs that are growing very well. There are seven in all. They are smaller so we have them together, but we will be splitting them up soon, since they are growing so fast! We added two new feeder steers to the mix and we will be getting a few more of them later in the winter. We will be getting 50 new pullets in April and the usual 100 meat chickens in early April. We may also be doing our own turkeys again this year. Thanks to all who have already signed up for the CSA. Now is the time to sign up. You can sign up by going to the website www.orchardcountryproduce.com and go to CSA Experience. You can pay when you sign up with your credit card or you can send us a check. If you would like to sign up for all three session - spring, summer, and fall you will automatically get a discount of 6% when you sign up. If you would like to save 4% send us a check instead of using a credit card. So if you sign up for all three session and send a check for the amount before May 15 you can save a whopping 10%! If anyone would like to have a drop off spot for a CSA delivery for the 2015 season, please let us know. We would be glad to work with you about getting a delivery set up for your location. You would need to get at least 6 shares (any size) for a delivery. If your business would like to have a CSA information session with Gregg or Oliver during January or February, please let us know. We are also looking for more apartment complexes to have CSA deliveries. If your community or building would give us a chance to work with them, please let us know and we will contact the right people in the complex to get a delivery set up. Sometimes if residents do the asking it helps to get us a opportunity. Please keep us in mind. We MAY also be looking for a new Farm Stand location for a new Saturday market - probably in Northern Virginia - not too close to Fort Hunt Rd. We do not want to compete with ourselves! If you know of any locations with good visibility and possibility, please let us know. We intend to be back at Westminster Farmer's Market, St Luke's Farm Stand, East Columbia Library, NGS Farm Stand and DOT Farmer's Market. We are also hoping to be making deliveries to all the same locations as last year. If you are associated with facebook you saw our family photo from Christmas. We love seeing you folks throughout the year. you usually do not see all of us, but that picture should help you to keep us in mind as your farmers! As you probably know we have seven children - Oliver and Stuart are the only boys - they were standing on either end of the back row in the picture. We have five daughters. Each of the girls were sitting in front of their husbands. In order- Lydia, Katie, Martha, Sarah (almost married) and then Virginia ( not married). Tamara (Stuart's wife ) was on the end. Sarah is planning a March wedding for this year. So we are gearing up for it - before markets start for us and before The Twirley Top opens for the year. Whew! This was a long letter! I hope that you were able to read it through to the end! Let us know if we can do anything for you or if you have any questions about the farm. Thanks for your support! Posted 12/22/2014 3:16pm by Gregg Keckler.